The 10-hour flight from LAX was horrible, with a lot of turbulence and about a half hour of sleep. The next 6 weeks, though, were nothing less than a dream. During the week, my group spent our days traveling to villages to teach the people different things to help them become healthier and more self-reliant: how to build a square-foot garden or an adobe stove, how to start a small business, or how to improve school infrastructure. The people were beyond poor, but they were the happiest people I have ever met. In fact, it’s interesting how much you learn about happiness and money from people living on less than $1 a day. My first weekend there, we stayed in a posh resort hotel on Denerau Island. Five of us packed into a room with two double beds to drop the cost, and I faced my fear by sharing a bed with the girl from the airport. The next day we chilled on the beautiful white sand beach and ditched the gift shops and went to the handicraft market in Nadi. A few weeks later we took a seven-hour bus ride across the island to go white water rafting on the Upper Navua River. The icy cold river, waterfalls, gorges and jungle atmosphere were a refreshing contrast to the warm waters and sandy beaches we had already seen so much of. Most of our other weekends were spent at different hostels across the island where we could anchor down for dirt cheap and enjoy the beach for a couple of days. 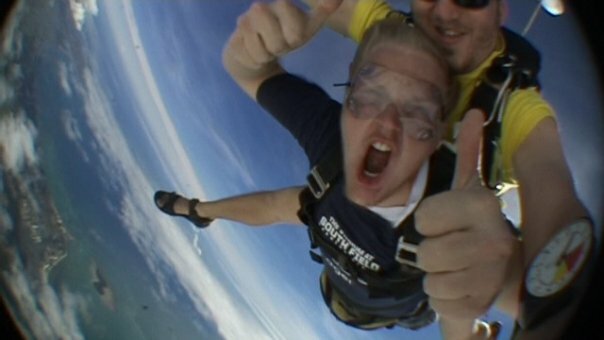 After our first trip to Denerau Island, we went back a couple of weeks later so I could face another fear: skydiving. I’ve always been terrified of heights, but some of the girls had gone a few weeks earlier and convinced me that if I died, it would be quick and painless anyway. Fair enough. There was only one skydiving company on the island and the price was fair. It was only about $250, which probably explained all the duct tape I saw inside the tiny airplane that took us up to 12,000 feet. I can’t describe to you the feeling of terror I felt when they opened the door of the plane and all I saw below me was clouds. It took some coaxing to get me to the door, but as soon as we were out, to say it was exhilarating is an understatement. After falling through the clouds, I looked out over the ocean and saw islands for miles. Thousands of feet below me was nothing but sailboats and blue water. It was a raw beauty that I’ll never forget. If you know anything about me, you know that wherever I go, I’m all about immersing myself in the local cuisine. The only problem is that Fijian cuisine is not that impressive. About half the population is Indian, so they have a lot of curry dishes, which is great if you like curry. But after spending the aforementioned seven-hour bus ride on Immodium A-D (don’t worry, we hit all the potholes, which ended up being about one every two inches), that’s just not me. One night, one of the villages put together a feast for us. They had fish, crabs, the chickens we saw earlier that day, and a bunch of other non-descript (in appearance and taste) slimy substances. I ended up getting talked into eating the spiciest pepper in my life. My act of manhood ended up with me curled in a ball with sweat and tears pouring down my face. One of the locals thought he would be helpful and told me to drink the coconut milk, although he didn’t mention that it was the coconut milk they fried the fish in. So yeah, mostly fish oil, not a lot of coconut. After that, I stuck with the rice, vegetables and fruit during the week and binged at the Hard Rock Café on the weekends. One thing that I did enjoy was kava. If you’re not familiar with it, it’s made from the root of the kava plant. Ground up and dissolved in water, it tastes a lot like dirt, but it’s mildly sedating and relaxing without disrupting mental clarity. They have the drink at just about every ceremony (not surprisingly, they seem to have a ceremony for everything), and it made getting to know the locals a lot easier. About a year after I went to Fiji, when I was engaged to my wife, her family took a trip to Hawaii. And let me tell you, Fiji beats Hawaii by a long shot. When you get out of the main touristy areas, the culture is richer and the people are ridiculously friendly. While the flight is a little more expensive, it’s also a lot cheaper to do things once you get there. I’d hate to say my experience there was once in a lifetime because I’m definitely planning on going back someday. Have you been to Fiji? Is it on your bucket list? This sounds like a great story and you tale of people on so little money being so happy is true of so many places. 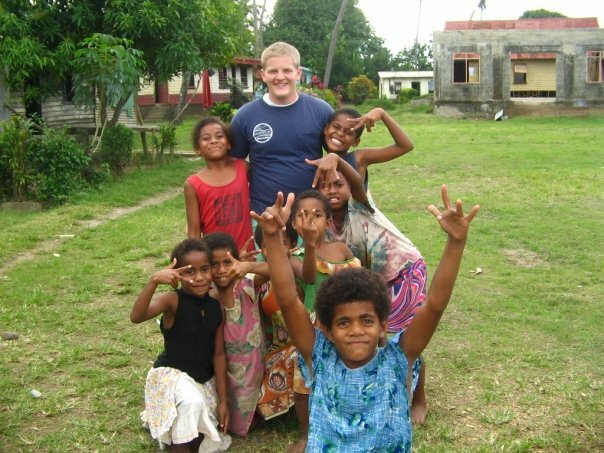 I’d love to see Fiji one day. I would definitely recommend it! I dream about going back all the time! Yes, definitely sounds like paradise!